(CNN) -- There are some pretty unusual sites on the Las Vegas Strip. But snow on palm trees stole the show Thursday. 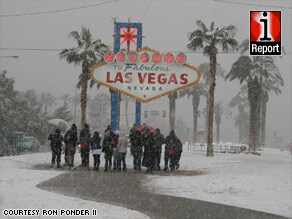 A group in awe of the snow gathers at the iconic Vegas welcome sign. The heaviest Arctic blast in nearly three decades has coated the normally sunny city. Tourists and locals handed off cameras, taking turns snapping pictures for posterity. On the Strip, a couple holding two tall fruity drinks clutched each other to stay steady in the ice. The iconic "Welcome to Fabulous Las Vegas" sign was dusted in white. Business people who normally hop day flights between Las Vegas and California were seen in hotel lobbies scrambling to find an available room. The New York New York Hotel & Casino actually looked like the real New York in December. "No work was getting done yesterday," said iReporter Jason Dinant, who works for a nightclub. "Everybody was like, 'It's snowing, it's snowing! Can we go outside?' "
Darryl and Maria Roberts' children, ages 8, 10 and 16, were ecstatic to build their first snowman. Frigid weather keeps its grip on most of U.S.
"They had never seen snow," said their father, who contributed a video to iReport of the kids playing. "They made snow angels for a couple of hours." The snowstorm, caused by a low-pressure system, was the eighth worst ever recorded in Las Vegas. The Strip got close to 2 inches, and the outskirts of town received 6 inches, according to the National Weather Service. The city had a 2-inch snowfall in 2004. The snow forced 8,000 customers to lose power Wednesday, but by Thursday morning, electricity had been restored, said Nevada Energy spokesman Adam Grant. The storm brought more hassle, too. Those dreaming of a holiday weekend in California or Vegas will probably have to park it. Parts of Interstate 15, which links the two states, have been closed because of huge snow drifts, according to California Department of Transportation spokeswoman Terri Kasinga. Cars very slowly inched along Vegas streets, which remained slushy and icy because the city has very few road-clearing machines. Annette Miller lives in the southernmost part of the Las Vegas valley in a collection of neighborhoods that is home to thousands. She drove home from work thinking she could make it, but her Toyota Prius disagreed. The typically 15-minute trip took six hours, and when she finally arrived at her street, her Prius got stuck in the snow. Her husband, also driving home from work in his Prius, got stuck nearby. "Our whole neighborhood was like a MASH unit, everyone trying to push everyone's car to the side of the street," she said. "My only complaint is that I wanted to know from some government agency, anyone, whether it would have been smarter to stay off the roads. We didn't have that. I would have gotten a hotel room." iReporter Nicolas Capra will be heading to work as a valet on the Strip later Thursday, though he knows he might not make much money. "A lot of locals around here hate it," the Denver native said, chuckling. "You know, it's 'I didn't move to the desert to have this.' "
At McCarran International Airport, which has no snow-clearing equipment, travelers camped in the terminals Wednesday night as 3.6 inches blanketed the tarmac. By Thursday afternoon, all flights had resumed and airlines were trying to rebook stranded passengers, according to spokesman Chris Jones. The wintry weather also whipped California. There were at least 20 inches of snow in Wrightwood, 5 inches in the hills above Malibu and 6 inches or more in Palmdale, according to the Los Angeles Times.